This course will help you to learn more about emotional intelligence and how to develop your emotional and social awareness and your capacity for expressing and managing your emotions. You'll learn how you can improve your overall social, professional and leadership effectiveness by developing your emotional intelligence. As well as exploring how to manage and work with your own emotions, you'll also learn how to identify and respond to other people's emotions in a positive and constructive way. 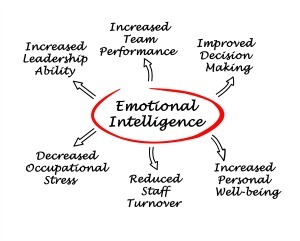 Evaluating what is emotional intelligence, why it's important and why successful leaders score highly in this area. Exploring the different dimensions that comprise emotional intelligence (EQ) and its benefits for work, leadership and life, including the core EQ competencies of self-awareness, social-awareness, self-management and relationship management. Consider how you can develop emotional awareness (of both yourself and others) and how you can learn from your emotions to improve tasks like thinking, creating and problem solving. Explore ways to identify and manage your own emotions and the emotions of others. Learn how to regulate your own emotions and influence the emotional reactions of another person (for example, by calming them down, cheering them up and reassuring, motivating, or inspiring them). Discover how your mindset and environment can impact and influence how present, engaged and 'emotionally intelligent' you are being. The impact of your beliefs and perceptions and how your head, heart and gut instinct are all inter-related. Steps that you can take to develop a strong inner foundation to empower, calm and support you, even when feeling challenged. Expand the range of your emotional expression and emotional vocabulary. Develop personal and leadership effectiveness through increased flexibility in your emotional responses. Improve relationships and motivate or engage others using the skill of active listening. Learn why vulnerability, being genuine and demonstrating emotional courage will earn respect and enhance your relationships. Learn what it takes to be an emotionally courageous leader and be able to communicate and express your thoughts and feelings with confidence, assertiveness and authenticity. Consider how to apply what you've learnt back into the workplace, in your relationships and life in general.